Phoenix Mayor Greg Stanton is fed up with Arizona pre-empting his city’s laws. From guns to puppies, the state keeps telling its citizens they can’t have the laws they want. The Arizona State Capitol building in Phoenix. Over the past five years, conservative states have been in a lawmaking frenzy to overrule local ordinances on issues as diverse as the minimum wage, taxicab licensing, workplace discrimination, and who may use which bathroom. It’s called pre-emption, and as I wrote earlier this month, it has become the most powerful statehouse tactic of our time. What began as an industry-driven attempt to abolish cities’ restrictions on guns and smoking has evolved into a reflex to restrain virtually any local initiative that a statehouse doesn’t like. North Carolina’s homophobic and transphobic HB2, passed by a heavily gerrymandered statehouse to abolish a Charlotte anti-discrimination law, is a notable recent example. But the capital of pre-emption may be Arizona, whose statehouse has been uniquely aggressive in its drive to dismantle local control in Tempe, Tucson, and Phoenix, three left-leaning cities. Arizona’s Legislature has quashed local laws on everything from puppies to guns. It has pre-emptively pre-empted cities from making laws about plastic bags or employee scheduling (i.e. requiring employers to give advance notice of shift changes). And this year, it passed a law that suspends city funding for services like police and fire if the state attorney general finds conflict between city and state laws. Last week, I sat down with Phoenix Mayor Greg Stanton, a Democrat, to ask what it’s like to steer the country’s sixth-largest city around a statehouse that seems determined to counteract it at every turn. Our conversation has been edited and condensed for clarity. Henry Grabar: Most Arizonans live in urban areas, in places like Phoenix and Tucson. How do you explain this divide between what’s happening in the state Legislature and what’s represented by municipal governments? Greg Stanton: It’s who we represent. When I run for office, both for my election and my re-election, I have to face all the citizens of Phoenix. So I have to adopt smart, broad-base policies for economic development. Conversely, in the Legislature, there are so few competitive districts. Once you win your primary, you’re good to go, and in the primary you’ve got to run further and further to the right if it’s a conservative district, or further to the left if it’s more of a Democratic district. So you have this extreme polarization that occurs in the Legislature with a majority on the conservative side, and that’s the way we operate. Let me give you a perfect example. Moving forward, the No. 1 area where [the debate over state and local authority] is going to come to a clash is climate change. Cities are going to have to adopt aggressive policies on climate change. I do so under constant threat that they’re going to try to pre-empt us at the Legislature, in a body that has, arguably, a majority of climate deniers. The city of Tempe tried to do a plastic bag ban to keep those plastic bags out of the landfills, and the Legislature immediately pre-empted them. Why not give a city like Tempe a chance to pass a policy like that, see how well it works? By doing this pre-emption thing, they’ve really taken away cities’ abilities to be laboratories of experimentation about big public policy. We miss out on that opportunity. You kill it before it begins. I know that North Carolina had a state law that no city might take climate change into account when drafting a general plan or approving zoning changes or stuff like that. Is there any equivalent in Arizona where the state Legislature is explicitly telling you what to do on that front? Climate change is affecting Phoenix, Arizona, as much as any other big city in the United States of America right now. Not in the future. Energy benchmarking is a very simple public policy that said for buildings, office buildings above a certain size, you have to disclose information as it relates to energy consumption, water usage, solar, whatever it may be, so that tenants can vote with their feet as to what building they want to be in. 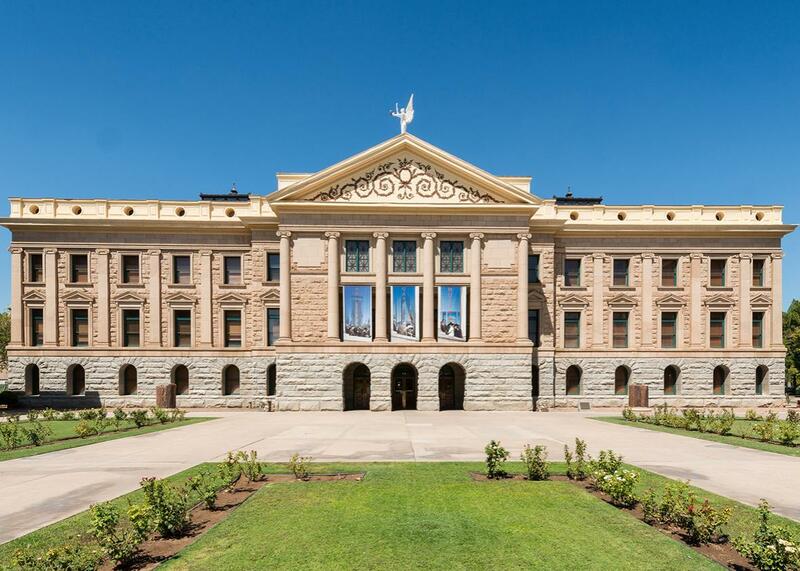 At the beginning of the conversation, the state Legislature passed a law banning the city—all cities including the city of Phoenix—from even a market-based policy like energy benchmarking. And this was pre-empted before it was even passed? Oh, yeah. Just the conversation about adopting the policy spurred the Legislature to ban cities from engaging in it. You served as deputy attorney general for the state of Arizona for two years. What are things like on the state level? The Legislature in the last session passed the mother of all local pre-emption laws. The law says that if any local ordinance contradicts state law—not in a court of law but if the attorney general determines it contradicts state law—we lose all our state shared revenue. So for the city of Phoenix, that’s $400 million. It seems shocking; that can’t be. But that’s what the law says, so we’re operating in this environment where if we do anything that might violate state directive or a law, we could be at risk of losing state shared revenue. So it has a chilling effect at a time that cities like Phoenix, Tucson, Tempe, and Flagstaff are passing progressive policies, and that’s where the economic activity is happening. You’ve got to be a progressive city if you want to compete for jobs. You don’t have a choice. I mean look what happened when Mike Pence signed that law in Indiana, I mean, the tech community rejected Indiana. Look what’s happening in North Carolina right now as we speak. The state Legislature, if they’re a conservative body, should pass conservative public policy. But don’t pre-empt us from passing policies that represent our priorities. We just started a municipal ID in the city of Phoenix, so that all people living there have the opportunity to have identification. The Legislature is going to go crazy on that issue, but if you’re living in the city of Phoenix, we want you to have the opportunity to access city services. The list goes on and on about things that we are doing that are potentially in contravention of this state law. There’s going to be litigation over it. The law is unconstitutional on numerous grounds, and the Arizona league of cities and towns, if they haven’t already, is about the file a lawsuit on this on behalf of the city of Phoenix. You can’t take away due process rights. We have a right to go to a court of law to determine whether or not our ordinance is actually in contravention of state law. You can’t create a Star Chamber–type jurisprudence in which the attorney general somehow secretly determines whether or not it’s in violation of state law. You have a right to go to a court of law, this is the United States of America. What happens now that the state has passed this “mother of all pre-emption bills”? At least for the city of Phoenix, it’ll affect nothing for how we go about our business. We believe strongly that it’s unconstitutional, and we’re going to adopt public policies that are smart for our cities, regardless of this state law. So if the intent was to sort of scare, intimidate cities, at least in my city, we’re not going to be afraid. We’re going to do what’s right for the people of Phoenix. Is that an issue that you think crosses party lines? The state Legislature is Republican-run, but in Phoenix, are there Republicans who feel that these pre-emption laws disenfranchise them? You’ve mentioned business leaders thinking that the city should be able to make its own rules and so forth. My job as mayor is to do what I believe is in the best interest of the economy and the future economy of my city, regardless of political party. When Arizona has on occasion passed very divisive laws as it relates to our LGBT community, or our relationship with Mexico through 1070, that’s been really bad for business. I talk to real business leaders in Arizona that get very frustrated that they have to answer for these divisive public policies. “Why are you in Arizona when they adopt these sorts of things?” Divisive politics is bad for business. So you mentioned SB1070 and obviously that includes a requirement that local police check immigration status. Is that a case where there’s a little leeway for a city police department to say, “You know what, we’re not going to enforce this”? That’s a very difficult and complicated question. Try as they might in our state Legislature, it’s really bad for any elected official, myself included, to try to do something that would ever take away police officer discretion. I trust our police officers. So yes, 1070 is the law of the land, how it is enforced on a street level is really an issue of officer discretion, and I in no way am going to try to take that away, and I think it’s really bad for the Legislature to try to take away office discretion. The NBA just pulled the All-Star game and the NCAA just pulled their championship events over HB2 in North Carolina, as you know, and it seems like there’s a parallel to this musician boycott over 1070 that happened in Arizona a few years back. The artists were very high-profile, but in Phoenix we had a lot of conventions that chose not to come to our city just to avoid the controversy. Some actually had been planned and then pulled out. But the silent protest is where the city of Phoenix is competing with three or four other cities, and a convention doesn’t come to Phoenix because the organizers don’t even want to have to apologize or explain why they had come to Arizona during a time of controversy. What would your advice be to these North Carolina cities? There was an article in the Washington Post about businesses in Asheville that were struggling because people are not coming because of HB2. HB2 is going to be overturned. It has to be overturned. Common sense will ultimately prevail. If 1070 were before our Legislature right now, it would not pass because the business community would stand up and say knock it off, enough is enough. In fact, I really am proud of our business community because since 1070, there hasn’t been a piece of legislation that is blatantly anti-immigrant, anti-Latino in the state of Arizona because the business community really awoke, if you will, and said they’ve got to reassert their influence down at the state Legislature. Because a lot of those pre-emption laws are passed with the rhetoric that it’s business-friendly policy?